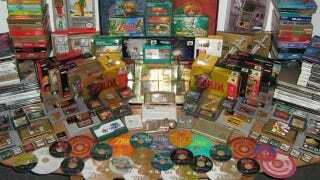 Have You Ever Seen This Many Zelda Games at Once? First Mega Man, then Street Fighter...there's a video game collection arms race going on, and The Legend of Zelda just joined in. Reader Andy "thought this would be pretty cool to show on the site". He's damn right it would be. Note he doesn't just have every game. For many he's got multiple editions. Look at all those copies of Twilight Princess!